Trade with Points: Use your points to pay for your online and mobile trade commissions — applies to stock, ETF and options trades placed on Canadian and U.S. exchanges, in Canadian or U.S. dollars. Grow Your Savings: Easily redeem points online to make cash contributions to your Registered Retirement Savings Plan (RRSP), Tax-Free Savings Account (TFSA), Registered Education Savings Plan (RESP), or deposits to your non-registered cash account. Earn RBC Rewards points with your RBC Rewards credit cards (link opens in a modal window). No setup is required. You can Trade with Points as long as you have an eligible RBC Direct Investing account and an RBC credit card that earns RBC Rewards points. Buy and sell investments, get real-time1 quotes, read current market news and more anytime, anywhere2 with the RBC Mobile app3. Pay just $9.95 flat per online equity trade4 with no minimum balance or trading activity required or $6.95 flat per equity trade4 with 150+ trades per quarter. The RBC Rewards program is offered by the Royal Bank of Canada. The use of RBC Rewards points is subject to the RBC Rewards Terms & Conditions. You cannot earn RBC Rewards points through RBC Direct Investing (RBC DI). 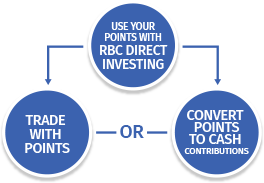 You may only use your points through RBC DI to: (1) pay for trade commissions on your eligible RBC DI accounts; or (2) transfer points to cash contributions to your eligible RBC DI accounts. It is your responsibility to make sure you have sufficient contribution room within your registered plan when transferring points to cash contributions to your registered accounts. The Canada Revenue Agency may apply tax penalties for over-contributions. RBC Direct Investing is not responsible for any such penalties. Real-time quotes are available upon accepting the terms and conditions of each exchange agreement, on the RBC Direct Investing online site. Available Only Where Permitted by Law. The products, services and securities referred to on any RBC Direct Investing automated service (as defined in the Operation of Account Agreement) are only available in the jurisdictions where they may be legally offered for sale. The information provided on any RBC Direct Investing automated service should not be construed as an offer by RBC Direct Investing to sell specific securities in any jurisdiction, including the United States. If you are not currently a resident of Canada, you should not access the information available on any RBC Direct Investing automated service. All RBC Direct Investing clients pay $9.95 flat CDN or U.S. per equity trade with no minimum account balance or trading activity required. $6.95 flat CDN or U.S. per equity trade when you trade 150 times or more per quarter. This pricing only applies to trades placed through an available Automated Service (as such term is defined in RBC Direct Investing’s Operation of Account Agreement), including the online investing site and mobile application. Additional terms and conditions apply. Visit Pricing or call 1-800-769-2560 for complete details.